Surrounded by all this Irishness in the Saintly City, sometimes I need to respect my Italian heritage somewhere other than in the garden or in the kitchen. 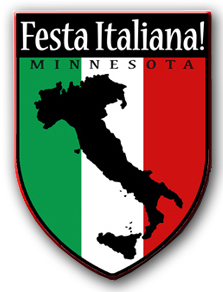 Awhile back we navigated the sea of road construction that is St. Paul these days and meandered to Harriet Island for (maybe) the first Festa Italiana Minnesota. We entered from the St. Paul Yacht Club Classic Boat Show on the East end of Harriet Island Park. The riverfront was transformed into Little Italy with laundry flapping overhead and red-checked covered tables lining the pathway. As you would expect the food was delicious — St. Paul does have an Italian history, after all. Maybe it’s more work for the vendors, but I much prefer using cash vs. tickets to buy food. Five dollars for Sausage and Peppers from DeGideos, $3 for a Cossetta Connoli, and $5 for a big piece of foccacia pizza were more than fair prices. All the food booths’ awnings were branded to match the logo pictured at the right. And the lines were long, but not impossible. I wish there had been large signs at awning level listing the prices and food for sale–there were a lot of curious people wondering what each booth was selling. I had no idea that Unico was selling “olives on a stick” — I thought there were just displaying information, so I didn’t even go to their booth. A low tech column of helium balloons made to look like olives with a price tag would have done the trick. So yeah, it was fun. The Italian cars were gorgeous, the bouncy houses made the kids happy, but something was missing. My husband said it was music…where was Frank Sinatra? But I don’t associate Italy with music. I think of fashion, crumbling buildings, twirling pasta with a spoon and fork, and biscotti in milky coffee. ← Come Learn Social Media with Me…in a Bar!